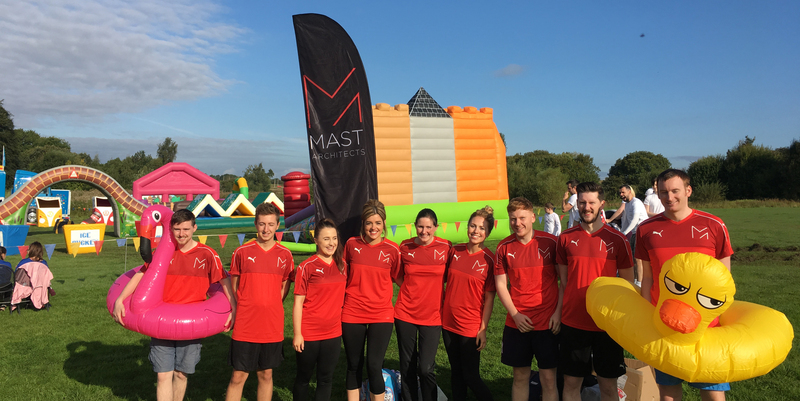 Saturday 2nd of September saw a team from MAST Architects take part in the It’s A Knockout charity day organised by CCG (Scotland) Ltd as a fundraising event for St Andrew’s Hospice. The day saw teams from a variety of different companies compete against each other on the assault course, through water, soap and inflatable jungle rivers. MAST donned the now famous company colours and took to the turf as the crowds gathered in the sun soaked Strathclyde Country Park to watch the events unfold. With a respectable mid-table finish, team MAST made it through the day relatively unscathed – apart from Karen and Holly however, who were selected to take the warm up for all the competitors –‘mortified’ was the word used I believe! !